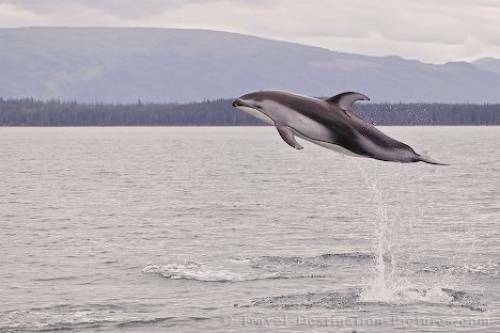 A frisky dolphin leaps into the air after riding in the wake of a boat as though to say "do that some more!!". Also nicknamed Lags because of their lengthy and cumbersome scientific name "Lagenorhynchus obliquidens", the Pacific White Sided Dolphin has three main colours. Their bellies and chins are creamy white while their back - including part of their dorsal fin and flippers is dark gray. They have patches of light gray on their sides and the back edge of their dorsal. Pacific White Sided Dolphin, Lagenorhynchus obliquidens, Northern Vancouver Island, British Columbia, Canada, North America. Picture of a leaping Pacific White Sided Dolphin in Queen Charlotte Strait, British Columbia, Canada.